Also, I intended to make the map only 512x512, but that proved to be a bit too small in getting the colors on the right places. Anyway, here's another render of it with a small thumbnail of the map. With these units there is a difficult decision as to what level of detail is required, and I suppose it will take a few iterations to get it right. For the most part I envisage that the player won't be too near them at any time. But, if there are any animated cut scenes later on starring these models, they should at least look the part. So, this model clocks in at just under 7000 triangles. If that's too much or too little, I don't know. From these pre-renders, the quality looks ok-ish to me. And I still got to do all the normal maps as well. 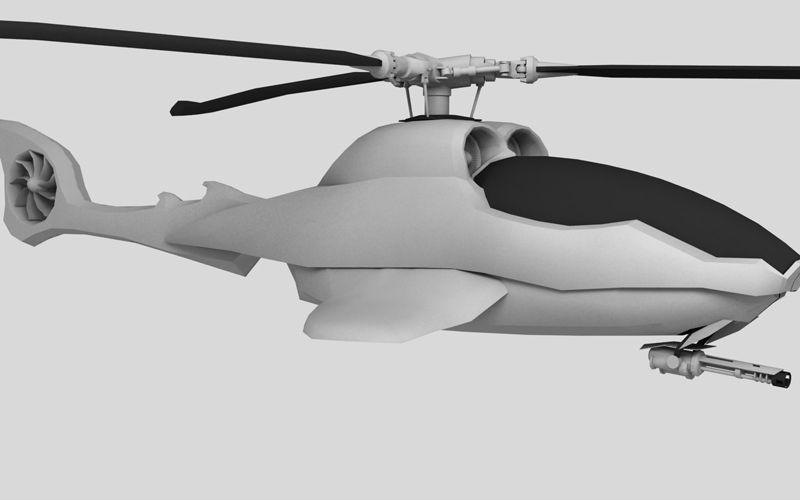 Ramon also sent me a render of the chopper. This is already a week out of date, and he has already started unwrapping it I believe. As you can see, he put a lot of effort into the rotor mechanism. It's something that will be on the screen almost all the time, and I think it's stellar. There's also a lot of animation loops he's got to do still. The wheels, bay doors and the various guns and their different animations. Hopefully I'll be able to figure out how to get it all into the game itself.